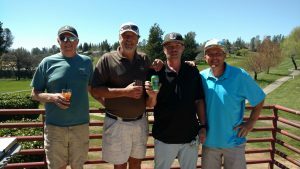 Congratulations to our NCCC Team (Dylan Murty, Dave Rivenes, Jay Snyder & Jake Jacus) who TIED FOR 1ST PLACE at the NCGA North Valley Zone Tournament at Quail Lodge & Poppy Hill last week with a 2 day total of 25 under par!! Unfortunately, only 2 teams from each zone are allowed thru to the finals, and there were 4 teams tied at 25 under – Nevada County, Plumas Lake, Arbuckle & Buckingham. In a playoff, Plumas Lake took the title & Arbuckle got the other spot.